The new conference and event centre at Village Cay Hotel and Marina. The 1,800 square-foot two-story conference and event centre just erected at Village Cay in the heart of Road Town is gearing up to officially open its doors to the public. Ahead of its official opening in a few short weeks, the centre will host its first one-day Women’s Conference on Saturday. General Manager of hotel and marina Chaunci Cline told BVI News that even before the facility officially opens, it is already showing signs of being in high demand. “We are very excited,” a clearly ecstatic Cline remarked. Cline said she is pleased with the product and is hoping that it turns out to be one of the key venues in the territory. She sought to explain the reason for the new centre. 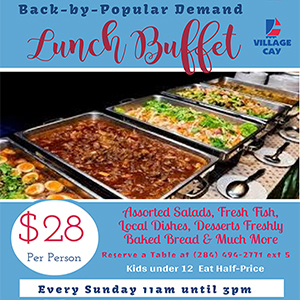 “Village Cay is becoming a very strong international hub for tourism and based on a customer survey that we did some time ago, we noted that we were lacking common space that was air-conditioned, that was an open, enclosed space for training, special events, [and] wedding receptions,” she said. It will be equipped with Wi-Fi, audio-visual offerings, and other high-end technology. The multipurpose conference centre will be able to hold a total of 70 to 100 persons. The upstairs will be used as office spaces for the hotel. The project began in July last year. It is being undertaken by Construction Engineering Systems. View from inside the new Village Cay centre. Good job – Needed in town. Seating capacity of 70-100 is good. But we got to think bigger. We need to seat 250+ attract MAJOR conferences.. Good start Village Cay. The view is amazing! If the people at the Pier Park were smart they would advocate for something like that. There is enough space and supporting infrastructure over there to do a proper facility that could host major conferences. It will also benefit the hub of businesses that are already out there. Pier park had a plan for all kinds of things including a church. What happen? Hurricane come that will blow down,town and country really approved that. Not necessarily! The pier park has buildings that look similar and they’re standing right there after Irma. It all depends on the structural integrity of the core part of the building. Why do the windows open to the outside? New style? @ visitor — You are a great observer. The windows have been put in the wrong way. Same happened in my house. In order to clean them outside we have to put up a scarfolding….. but it’s a nice building. 150 seats would have filled most of the needs for our charity events. I’m confused by your first question. Do windows usually open to the inside? And what does it matter what it cost? It’s a private sector project. Where’s the parking spaces to support the additional cars this site will draw? What about the Marina and restaurant. Surely by fixing them up they would generate a lot more revenue. Build quality – not sure – bottom is breeze block while top is plastic siding with steel frame. Lookslike it would just peel off in a big blow. A proper conference centre will need a proper hotel but there are no decent quality hotels in Road Town other than a handful of the rooms at Mariners. Lets try get better rooms.